Home » Answers to Jehovah’s Witnesses » Is Jesus Michael the archangel? Summary: The Watchtower Society teaches that Jesus Christ is the same person that the Bible calls Michael the archangel. This identification is part of the Jehovah’s Witness doctrine that Christ is a created angel rather than God. However, the Bible never makes this identification and in fact contradicts it. Notice that the Watchtower Society argues here that Jesus Christ, as Michael, “refrained from overstepping his authority” because he was only “the Chief Angel” and that “it was not his place to bring judgment.” We have here the Jehovah’s Witness doctrine of the person of Christ in a nutshell: Jesus Christ was Michael, the chief angel, not God. There are five references in the Bible to Michael (Dan. 10:13, 21; 12:1; Jude 9; Rev. 12:7), and in none of these passages is Jesus actually called Michael. The Watchtower Society has admitted that “there is no statement in the Bible that categorically identifies Michael the archangel as Jesus.”3 Nor does the Bible ever explicitly describe Jesus as an “archangel” (a word that appears in the canonical books of the Bible only twice, 1 Thess. 4:16; Jude 9) or as any other kind of angel. This puts the burden of proof on the Jehovah’s Witness to explain why they believe that Jesus is Michael. By way of contrast, the New Testament repeatedly refers to Jesus explicitly as “God” (John 1:1; 20:28; Titus 2:13; Heb. 1:8; 2 Peter 1:1).4 Yet the Watchtower Society goes out of its way to argue that he is not God! Since there is no comparable statement in the Bible that calls Jesus Michael or gives him the title archangel, the Watchtower offers “Scriptural reasons for drawing that conclusion.”5 We will consider each of these arguments one by one. People could have two names. In these instances, the Bible explicitly states that the two names belonged to the same individual; there is no need for guesswork. It is surely hazardous to base a doctrine on the possibility that the two names Jesus and Michael might belong to the same person without some statement to that effect. According to the Watchtower Society, “The prefix ‘arch,’ meaning ‘chief’ or ‘principal,’ implies that there is only one archangel, the chief angel.”7 On the premise that Christ was originally an angel created by God before everything else, Jehovah’s Witnesses conclude that he must be the chief angel and hence Michael. Essentially, this is an argument from the etymology, or root elements of the word. Biblical scholars have been warning for decades that such appeals to the etymological forms of a word to determine its meaning are often erroneous.8 In this particular case, there are compelling reasons to reject the Watchtower’s argument. First of all, some compound nouns using arch- are used in the Bible in plural forms to refer to a group of individuals, such as “chief priests” (archiereis, occurring 50 times in the New Testament, e.g., Matt. 2:4; Mark 14:53, 55; Luke 19:47; John 19:6) or “chief bodyguards” (archisōmatophylakes, Esther 2:21, LXX). When used as a part of titles such as these, the prefix arch- simply indicates that those who hold this title occupy a higher position than others. It tells us nothing about whether that title is held by one individual or more than one. Second, if the word archangel by definition could refer to only one individual, then we would expect to find it always used in this way in ancient literature. To the contrary, ancient Jewish texts commonly speak of a group of archangels, either four or seven. Michael, Sariel (or Uriel), Raphael, and Gabriel are the usual four archangels; in lists of seven archangels, Sariel and Uriel are treated separately and the names Raguel and Remiel are added.9 The point here is not that these Jewish texts carry any divine authority as inspired Scripture. The issue here is lexical—what the word meant—not theological. Perhaps there is only one archangel, or four, or seven, or a hundred. The Bible does not say explicitly how many there are. The word “archangel” does not answer this question. Michael is called the archangel (Jude 9), indicating that he is the only one. Jehovah’s Witnesses often appeal to the use of the Greek article (translated “the”) in theological arguments. Such arguments need to be considered very cautiously, as it is easy to make mistakes. Here the Watchtower argues that since Michael is called “the archangel” in Jude 9 “This suggests that there is only one such angel.”10 This inference is fallacious. The expression “Michael the archangel” is similar to the expressions “the angel Gabriel” (Luke 1:26) and “Nathan the prophet” (2 Sam. 7:2, etc. ), which of course do not mean that Gabriel was the only angel or that Nathan was the only prophet. The article tells us nothing whatsoever as to whether Michael was the only archangel. There are no references in the Bible to archangels in the plural. The Watchtower Society has repeatedly pointed out that the term archangel “occurs in the Bible only in the singular, never in the plural.”11 This sounds like an impressive point until one considers the fact that the word archangel occurs only twice in the whole Bible (1 Thess. 4:16; Jude 9)! Other words appear in the Bible that happen for whatever reason to occur only in the singular form, but that could have been used in a plural form in reference to more than one person or thing. A particularly relevant example is the word “chief tax collector” (architelōnēs, Luke 19:2). The standard lexical reference work by Louw and Nida explains this term to mean “chief tax collector, in the sense of one who controlled activities of certain other tax collectors—‘chief tax collector, director of tax collectors.’ …It is also possible to understand ἀρχιτελώνης as meaning a principal or important tax collector rather than one who controlled the activities of other tax collectors.”12 Zacchaeus was obviously not the head of tax collection for the entire Roman army, but just for his territory or region. So here we have another noun with the prefix arch- (“chief”) that can refer to more than one individual (in this case a group of principal or supervisor tax collectors); perhaps we could translate the term “senior tax collector.” The word just so happens to occur only one time in the Bible and in the singular. Likewise, from the fact that the word archangel occurs only as a singular in the Bible, we cannot reasonably infer that there can be only one archangel. This is a hasty generalization (since the word only occurs twice) and is proven to be mistaken reasoning from the fact that other words occur only as singular forms but that could be used as plurals. Daniel predicts that Michael will be the king at the time of the end (Dan. 12:1). “The prince of the kingdom of Persia withstood me twenty-one days, but Michael, one of the chief princes, came to help me, for I was left there with the kings of Persia…. But now I will return to fight against the prince of Persia; and when I go out, behold, the prince of Greece will come. But I will tell you what is inscribed in the book of truth: there is none who contends by my side against these except Michael, your prince” (Dan. 10:13, 20-21). In this passage, Michael is the prince of Israel or of the Jewish nation, comparable to other supernatural beings that were the princes of Persia and Greece. Michael was not the only being of his kind, but is specifically said to have been “one of the chief princes” (10:13). This statement—the first reference to Michael in the Bible—immediately establishes him as one of a class of supernatural beings. He clearly cannot be the person later called Jesus Christ, not even in Watchtower theology, which while viewing him as a creature places him in a category of his own as the only creature made directly by God. Jesus has the voice of an archangel (1 Thess. 4:16). This plausible-sounding interpretation is mistaken for several reasons. First of all, Paul’s statement would be a very strange way of speaking if Jesus was an archangel. It would be like someone saying that when Abraham Lincoln went to Gettysburg, he went with the voice of a man—meaning his own voice. If Paul wanted the Thessalonians to learn that Jesus was an archangel, he went about it in a very peculiar way; and if he had already taught them that Jesus was an archangel, saying that Jesus was coming “with an archangel’s voice” would also be odd. The fact is that the text makes much better sense in context when we recognize that Paul is not speaking of Christ as an archangel. The most natural way to understand these three phrases is to take them as referring to three distinct sounds: a commanding cry, the voice of an archangel, and the blast of a trumpet of God. The first sound, the “commanding cry,” is given by “the Lord” himself, and in his cry is joined by the shout of an archangel and the blast of God’s trumpet.17 If this is correct, the “commanding cry” is not given by the archangel at all. In any case, the text simply does not equate Christ with the archangel. Indeed, Paul refers to Jesus Christ not as an archangel but as “the Lord” who “will descend from heaven.” This language clearly echoes texts in the Old Testament in which “the LORD,” that is, Jehovah (YHWH), came down or descended to meet his people (Exod. 19:11, 16, 18a, 19-20). In the cultural setting of Paul’s epistles, his imagery pictures an archangel as an authoritative representative of the divine king coming down ahead of the Lord, heralding his imminent arrival. As New Testament scholar Ben Witherington points out, “a royal visit to a city would be announced by a herald (see Ps. 24.7-10) and might well also be announced by a trumpet blast to alert those in the city that the king was coming.”18 Thus, the archangel’s voice functions as that of the herald coming in advance of the king and it should not be confused with the voice of the king himself. In short, a close reading of 1 Thessalonians 4:16 in its historical and cultural context shows that Paul distinguishes between Jesus, who is the divine, royal Lord, and the archangel who will come ahead of the Lord Jesus to herald his coming. Michael (in Revelation 12:7) and Jesus are both identified as the leader of an army of angels. This argument, if pursued consistently, would “prove” that Christ is not only Michael the archangel but also God the Father, since the New Testament also refers to the angels as God’s angels or the Father’s angels (Matt. 4:6; 22:30; 26:53; Luke 4:10; 12:8-9; 15:10; John 1:51; Heb. 1:6; Rev. 3:5). Since Jesus is not the Father, there is something wrong with this reasoning. We should not understand the Bible to be saying that there are two separate armies of angels, one headed by Christ and the other by Michael, nor that the one army of angels is headed by Christ who is Michael. Rather, evidently Michael leads the army of angels in Revelation 12:7 on behalf of Christ, who is his superior. Just as we might speak of the president’s army and also refer to it as a general’s army without identifying the general as the president, the New Testament speaks of Christ’s angels and also of Michael’s angels without identifying Christ as Michael. 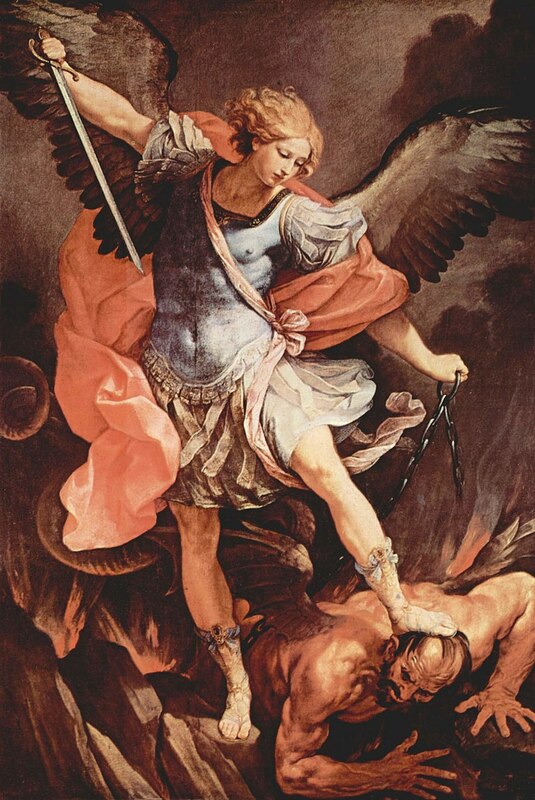 In Revelation 12, Michael and his angels are fighting the “great red dragon,” which represents Satan the devil, in a “war in heaven” after Jesus Christ was born on earth as “the Lamb,” shed his “blood” to conquer the devil, and ascended to God and his throne (Rev. 12:3-11). Far from identifying Christ as Michael, this passage pictures Christ sharing God’s throne and ruling with him while Michael and his angels throw the devil and his angels down to the earth. Reading Revelation 12:7 in context, then, makes it quite clear that Michael is not Christ. There are of course similarities between Michael and Christ in the Bible. Both are supernatural beings, both lead angelic armies, both fight on behalf of God’s people, and both have close access to the presence of God. On the other hand, the New Testament never identifies Jesus Christ as Michael, as an archangel, or as an angel at all. Rather, in various ways, the New Testament exalts Christ above the angels as their divine Lord. This point is developed in great detail in Hebrews 1–2, in which the divine Son is contrasted in terms of his titles and roles with the angels. The question, “To which of the angels did he ever say…?” (Heb. 1:5, 13) is a rhetorical question to which the understood answer is, “None.” The Son is not one of the angels, but is instead worshiped by them (Heb. 1:6) and identified as “God” and “Lord” (1:8, 10). 1. “Is Jesus the Archangel Michael?” Watchtower, 1 April 2010, 19. 2. “Imitate Jesus’ Humility and Tenderness,” Watchtower, 15 Feb. 2015, 6, repeated in Examining the Scriptures, March 2016, 27. The same point was made in “Honor the Son, Jehovah’s Chief Agent,” Watchtower, 1 Feb. 1991, 17. 3. “Who Is Michael the Archangel?” Awake!, 8 Feb. 2002, 16. 4. All biblical quotations here are from the ESV. For a discussion of the translation and interpretation of these verses, see Robert M. Bowman Jr. and J. Ed Komoszewski, Putting Jesus in His Place: The Case for the Deity of Christ (Grand Rapids: Zondervan, 2007), 138–56. 5. What Does the Bible Really Teach? (Watchtower, 2005), 218. 6. Ibid., 218; “Is Jesus the Archangel Michael?” Watchtower, 1 April 2010, 19. 7. “Archangel,” in Insight on the Scriptures (Watchtower, 1988), 1:156; verbatim in “Honor the Son, Jehovah’s Chief Agent,” 17; see also “Who Is Michael the Archangel,” 16; “Is Jesus the Archangel Michael,” 19. 8. E.g., D. A. Carson, Exegetical Fallacies, 2nd ed. (Grand Rapids: Baker, 1996), 28–33; Grant R. Osborne, The Hermeneutical Spiral: A Comprehensive Introduction to Biblical Interpretation, rev. and expanded ed. (Downers Grove, IL: IVP Academic, 2006), 84–89. 9. Darrell D. Hannah, Michael and Christ: Michael Traditions and Angel Christology in Early Christianity, WUNT 2/109 (Tübingen: Mohr Siebeck, 1999), 29. 10. What Does the Bible Really Teach, 218. 11. Ibid. ; so also “Who Is Michael the Archangel,” 17; “Is Jesus the Archangel Michael,” 19; “Michael,” in Insight on the Scriptures, 2:393. 12. Johannes P. Louw and Eugene A. Nida, Greek-English Lexicon of the New Testament Based on Semantic Domains, 2nd ed. (New York: United Bible Societies, 1989), §57.185 (1:579). 13. “Michael,” in Insight on the Scriptures, 2:394. 14. “Is Jesus the Archangel Michael,” 19. 15. “Michael,” in Insight on the Scriptures, 2:393–94; What Does the Bible Really Teach, 218. 16. “Who Is Michael the Archangel,” 17. 17. Several exegetical commentaries discuss this question, e.g., Charles A. Wanamaker, The Epistles to the Thessalonians: A Commentary on the Greek Text, New International Greek Testament Commentary (Grand Rapids: Eerdmans, 1990), 173, who supports the interpretation favored here. 18. Ben Witherington III, 1 and 2 Thessalonians: A Socio-Rhetorical Commentary (Grand Rapids: Eerdmans, 2006), 138. 19. What Does the Bible Really Teach, 219; see also “Michael,” in Insight on the Scriptures, 2:394.